The Argus sits down with Transgender Medicine Program Navigator Angel Roubin and Director of Public Relations Amanda Falcone. The Argus: How would you describe your role at the hospital? Angel Roubin: So basically, I man the hotline. When someone receives a referral from either the internet…or another provider, I am the person they talk to when they call in. I conduct a brief telephone screening to find out which of our services they are interested in and provide information about the services we offer. I provide a supportive service as well, in terms of just validating people for calling in and seeking help and welcoming them into our system. A: So do you work with other LGBTQ services, or is it mostly transgender services? AR: It’s mostly transgender services. I should add that I am also a psychologist, so I do carry a caseload of six or seven therapy clients at this time. I also facilitate a monthly gender discussion group. What I’ve found in running this group is that it [is composed of] a primarily transgender population, but we have some allies who come to the group too. The idea of sexuality will often come up in our group…but our services are for a transgender population. A: So the main thing I want to discuss is the Human Rights Campaign Foundation (HRC Foundation) 2017 Healthcare Equality Index (HEI) that recognized Middlesex Hospital as a “Leader in LGBTQ Healthcare Equality.” What was your role in facilitating that? How did the survey process work? Who was in charge of communicating your policies to the HRC Foundation? AR: Clare Davis, who is the representative from our hospital, facilitated that. She’s the Director of Quality at the hospital. We have a monthly program committee meeting that takes place, and Clare is a part of that. My role was attending the meetings and having conversations about treatment of patients and our policies and how we are making changes to our registration process to reflect the fact that we have people coming in who are perhaps transitioning….I shared discussions I have had with patients and their thoughts about our system. Amanda Falcone: The hospital has done quite a bit recently to make sure it treats everyone appropriately and is a very welcoming environment for all individuals. We are very proud of the designation, but our day-to-day actions and welcoming environment are more important. 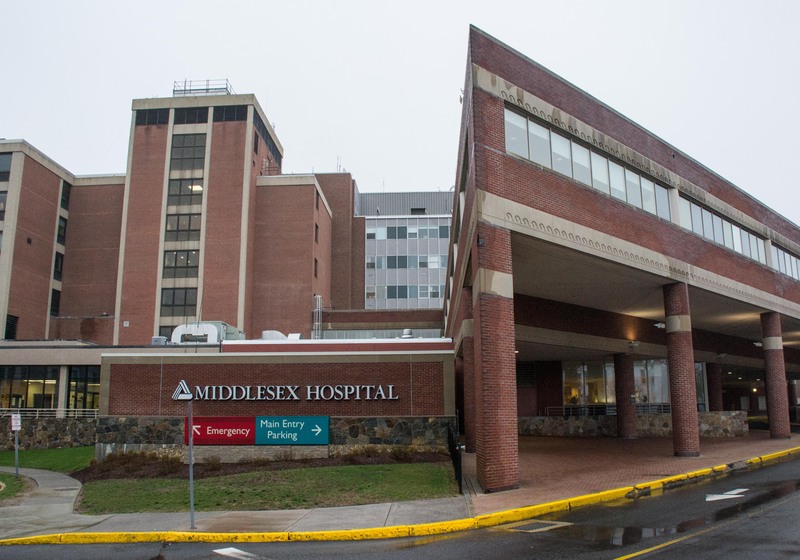 A: There have been growing concerns about healthcare inclusivity…so has Middlesex Hospital changed its policies in past years as these issues have become more and more discussed? AR: I can see from a behavioral health standpoint that there has been significant training related to LGBTQ issues in our clinics. We recently implemented an electronic medical record system with a special designation given to transgender patients….We also do annual training, and I know that each year [the hospital] intends to include a segment about LGBTQ issues in the training….Also, all hospital bathrooms have been changed to all-gender bathrooms and signs in windows display the LGBTQ rainbow pride flag and the pink, blue, and white transgender flag. A: Do you think that this kind of surveying and monitoring process has an effect on pressuring facilities to make their policies more inclusive? AR: I definitely think so. [These issues] are all over the place: in the media, our court houses, everywhere. We are recognizing the importance of serving this population and its great need. Hearing what people have to say, these are services that are very much needed. There is a lot of pressure on other hospitals to provide these services. AF: For Middlesex, I think it reinforces that we are doing good work here and gives us another reason to continue that work. It gives us a little extra incentive. A: Have you seen any threats to inclusive healthcare at Middlesex Hospital or in the state legislature? The HEI report talks a lot about North Carolina and the bill that was passed there last year that eliminated anti-discrimination legislation. AR: Personally I haven’t heard of or seen anything. It is something of course that I am aware of. I am hearing specifically from groups that Connecticut is a very good place to be for someone who is in the process of transitioning or has already transitioned because the state’s polices are very liberal in terms of changing your birth certificate and…your license—it is just a matter of paperwork—so I think people feel very safe and protected here. Just sitting in on meetings where we talk about how to create a culture of acceptance, some of the terms that are being used like “zero tolerance” are promoting sensitivity and empathy and compassion for all of our patients. I think it is really opening our eyes to making us better providers in terms of being more open and compassionate. A: You’ve talked a little bit about programs you have in place. Do you have any other community outreach programs or policies at the hospital that you’re particularly proud of? AR: We are in the beginning stages [of providing these programs]. I know that we are participating in community events and advertising our services. There’s a Connecticut Transadvocacy Coalition event on the 28th and 29th, so we are participating in events like that. Our monthly group we have is where I’ve received the most positive feedback in terms of people coming in from the community. A game night open to the community has stemmed from that monthly group and provides a space for people to gather and socialize because that is a huge piece of what’s missing in this community. We’re still in the beginning stages, but the committee we have and the people I’m working with are open and flexible to anything that comes their way. We are constantly trying to adapt to provide the best care…. AF: I’ll add one more thing. I was talking to some patients of ours about this topic. They spoke about how welcoming the environment is and just that it’s refreshing to be in a place where people can feel comfortable. We try to do that, to make things better and make everyone feel comfortable. A: Do you have anything else you’d like to add? AR: A lot of people call in wanting “bottom surgery,” but that’s not something we offer here. We make an effort to gather information about national resources, so I want to highlight that if there is something someone’s looking for that we don’t offer, we also serve as a resource for information about other places they can go.